Inspiring the development of music education. In recent years, traditional local authority music services have contracted and in some cases have been cut altogether. The relatively new Music Education Hubs, were launched to plug the gap and take forward a new way of collaborative working. SoundStorm are now the lead partner for one of the 123 Music Education Hubs across the country. The combined effect of this for SoundStorm and other music education hubs, is that they need to deliver much more - but with fewer resources available to them. Overall the website needed to "work harder" for SoundStorm. The aim was to turn it into a valuable resource platform for their audience (teachers, parents, stakeholders and students). It also needed to communicate the vast range of work that SoundStorm undertake. An important goal for the SoundStorm website was to increase sign-ups to Ensembles and Events, and to build and grow their network of contacts and supporters. We created a look and feel that reflects SoundStorm's modern, youthful approach, which resonates with young people and inspires educators. We improved the general usability and functionality of the site, overhauling the navigational site structure in the process. Key features were buried in the menu previously, so we brought them forward with eye-catching icons on the homepage. The outcome is a clean website, which feels intuitive and accessible to visitors. We introduced a number of new features, in order to help achieve maximise user interaction with the website. We added a social media feed, which automatically pulls in updates from SoundStorm's social media channels, allowing them to show the breadth of their activity. We integrated the Mailchimp newsletter sign-up form into the footer so that it is active on every page, and rebuilt the website forms to easily allow users to contact SoundStorm, or to register for different opportunities online. Another key goal for the site was to communicate the inherent value of music education using "stories, not stats", by telling the stories of their users rather than reducing it to economics. 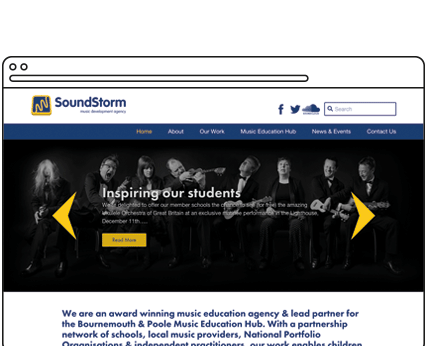 In order to help achieve this we introduced a "testimonial" feature, which displays a random user story, thus demonstrating the huge impact that SoundStorm has within the local community and national music education sector. "Wired Canvas showed great interest and insight in helping us shape our website; supporting our thinking and guiding us through the redesign, it felt like a partnership and one that tackled changes (and hurdles) with no fuss. Thank you!"